This month my focus is on Lie-Nielsen’s No. 5 Jack Plane. As the frequent readers of this Blog likely already know, the “bench” planes start at the No. 1 (incredibly small) and sequentially work up to the No. 8, which is the jointer and the largest in the group. As you can readily tell by the numbers, the No. 5 is pretty close to center of the pack, in sequence as well as in size. The dimensions and materials of the No. 5 are as follows: 14” long and made from ductile iron, a 2” wide iron made from A2 steel that is .125” thick, and overall the plane weighs 5 1/2 lbs. The bronze lever cap is both extremely strong and beautiful, while the cherry tote and knob feel wonderful in your hands and add elegant warmth to the plane. The frog (45 degrees) and body on this plane have a fully milled fit so they mate solidly and hold the iron rigidly, leading to a predictable and controlled shaving. The mouth opening is user adjustable, without removing either the lever cap or iron/chip breaker from the frog. Operation is simple, yet robust. Unlock the two lateral locking screws, and then adjust the centralized adjuster screw clockwise (to move the frog forward, closing the mouth) or counter-clockwise (to open the mouth). Always make sure to monitor the leading edge of the iron when you close the mouth, so it doesn’t accidentally contact the front of the mouth, nicking or blunting your nicely sharpened iron. When you have the mouth opening you desire, engage the two locking screws, and then verify the intended shaving thickness can fit through the new mouth size. The functionality of the No. 5 can range from that of a larger format smoother to that of a rapid stock removal tool. For the first scenario as a smoother, I prefer to sharpen the iron with a barely perceptible camber, which reduces the chance of either corner digging into the wood. I use David Charlesworth’s technique of using a basic honing guide on water stones, and utilizing focused finger pressure on different areas of the iron along with additional passes on the stone, to regulate the removal of steel towards each corner. In this shaping/honing procedure I use a 1000 grit stone for the slight shaping, and then finish up by honing on the 8000 grit stone. The iron is held in the guide at 35 degrees (a 10 degree micro bevel, since the base angle is 25 degrees), for both stones. If you haven’t ever used a plane with a cambered iron, you should give this a try. Since there is such a small amount of steel removed when creating this slight camber, you can very quickly revert back to a straight cutting edge, simply by going back to your 1000 grit stone and following your old routine. If you decide to give the cambered shape a try, you can check out the DVD: “Hand Tool Techniques Part 1: Plane Sharpening”, by David Charlesworth, which provides excellent instruction. You can also stop by one of the Lie-Nielsen Hand Tool Events, and see the crew sharpen first-hand, as well as ask any questions that might arise. As a side note, the late (and great) Alan Peters chose to use his No. 7 (a much larger plane than the No. 5) as his smoother, which demonstrates quite a bit of flexibility in these planes. In the second scenario, where the plane functions as a rapid stock removal tool, I apply a more pronounced camber (but still relatively slight, especially compared to a scrub plane iron’s camber) to the iron, which certainly generates a more narrow focused wood removal area compared to the cambered smoothing iron’s shape. The corners on these irons are back from the leading edge by around 1/32” – 1/16”, so the shape gradually drops off from the center of the iron, out towards each corner. When I initially prepare this type of iron, I use my grinder to efficiently remove the excess metal, as even this seemingly small amount would take a fair amount of time and effort if you used only sharpening stones. I always make sure to use a very light touch on the grinder, so I don’t accidentally overheat the iron’s steel. I grind the iron freehand, moving its cutting edge through an arc on the grinder’s rest, mimicking the same 25-degree bevel as is original on the iron. I like to place a sharpie mark in the center of the back of the iron, and then about 1/32” – 1/16” down from the corners, on each side and draw a shallow curve connecting the points. This provides a visual target for my grinding, so I don’t go too far or take more off one side than the other. If I notice I’ve reached a nice, smooth looking curve across the iron, I’ll stop even if I’m not all the way to the full depth at the corners. Since I know I’m taking the iron to my honing stones next, there is really nothing dictating a specified shape, as long as it is a smooth continuous curve. The honing that follows will be at 35 degrees (again, a 10 degree micro bevel), and also uses the standard honing guide. You can readily work the full width of the iron in the honing guide, if you take your time and focus on smoothly transitioning across the curved iron. If your corners are left untouched on the honing stones, it just indicates the camber is a little more pronounced. This is nothing at all to worry about, as the corners on this shape of iron really never even touch the wood. The length of the No. 5 is such that it can also perform the role of a “jointer”, if you are working on smallish pieces of wood, perhaps for little boxes or the like. This is yet another example of seeing a tool’s full potential. You might even compare this type of thinking to putting William “The Refrigerator” Perry into the backfield as a running back for the Chicago Bears football team, even though he was by title a defensive lineman. I think we can occasionally pigeonhole ourselves (and our tools) and forget we have freedom to ultimately decide how we wish to best utilize our skills and tools. For each of these roles, I set the plane’s mouth so its minimum opening is just slightly wider than the shaving I intend to remove, thus preventing a jam. In the smoothing role, the mouth is usually quite tight, since the expected shaving is very thin (on the order of .001” – .003”). As you probably expect, I open the mouth wider for the rapid removal role, so the thicker shavings easily pass through. For the jointer role it is much more similar to the smoothing operation’s mouth, as the shaving is less thick, but the shaving still dictates the opening. There are additional accessories you can purchase that are geared to keeping the plane ready to use, such as the frog adjuster screwdriver, chipbreaker screwdriver and plane socks to help prevent rust. I think you’ll find the Lie-Nielsen No. 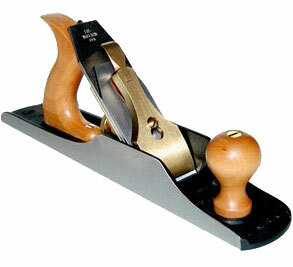 5 Jack Plane is a very flexible and handy sized plane to have in your kit. Come out to a Lie-Nielsen Hand Tool Event and test this plane first-hand, as well as see what else might be missing from your shop. I dig what you say, I keep two #5s at the ready. One has a flat ground blade with the corners relieved and another with a slight cambered grind again with the corners relieved. I wouldn’t attempt any serious work without either of them nearby. Not to say that I don’t use other sizes, I do. I also keep two #4s setup the same way along with two #3s, a #5-1/4, a #6 and two #8s. BTW, with the exception of the #5-1/4 and one of the #8s, they’re all early type Bed Rocks. I’m not so sure they’re superior to type 11 to 13 Baileys, but what the hey… The key thing is putting great replacement irons on them. I’ve used and still use Veritas, Hock, Lie-Nielsen, Clifton and Ray Isles irons. All are superior to the Stanleys. I forgot to mention that I also use several HNT Gordons too. Schweet! i enjoyed your article. I have two Lie-Nielsen planes. My first one which I must have bought 25 -30 years ago is the skew block plane which I probably use more than any other plane. The second one is the low angle smoothing plane bought about 7 years ago. When I have that one sharpened so that it will easily shave the hair on my arm, I am amazed at the job it will do. I haven’t quite eliminated sand paper from my shop, but with that plane i am getting closer. On another subject, Lie-Nielsen needs to speed up its efforts to develop a replacement for the Stanley 113 Compass Plane. The Kuntz is junk. Sounds like you have the bases covered, don’t you? I’m with you on the aftermarket irons for the Stanley/Bailey planes. Thanks for reading my article and for chiming in. Always love to hear from other woodworkers. Keep Planing! Thanks, I’m glad to hear you enjoyed the read. I enjoy working the Hand Tool Events and occasionally we’ll have someone drop by with one of tools from long ago. I love seeing the older tools. I’m glad you’re still enjoying the skew. Yeah, the LA smoother is a truly sweet plane. The adjustment is just so precise. As for the sandpaper, I think each wood/project should dictate whether anything else is needed, after planing. I’ve made dovetailed boxes for customers and family, that I take up through 800 grit paper, and they’re alway surprised at how “soft” they are, and they can’t stop feeling them. Ha, so just do what’s good for you. I’ll pass along your wishes on the Compass Plane. Hang in there. Ive got a question about which type of plane would be better for me. I own a no3 old bailey plane , no 4 lie nielsen with a 50degree frog , and a bailey no 6 and some blockplanes by stanley. Im thinking about buying a jack. Right now im building just small stuff like small boxes and stuff like that so i dont need a 7 or 8 right now. Ive got my no 6 set up for trying boards. Ive running circles in my head right now. If i should buy the no.62 low angle jack which offers a lot of oppertunitys to tune the irons. Or simply get a standart no.5. Im sure its not the last plane i will buy but for now i need something for rough work and maybe , cause im a apprentice in germany and i have to go to school workshop. A all around handy dandy tool like chris schwarz said. So would would you think which one of these two planes are better for what im dealing with right now. ? Please excuse my bad english skills cause like i said im from germany. If there is something you dont get just let me know. I believe I understand your question, and I have to compliment you on your english. I only wish my German was even close to as good! I have a fondness for the Lie-Nielsen #62 Low-Angle Jack, as I find it has much more flexibility. Many asked similar questions of me, while I was still working the Lie-Nielsen events, and I my thoughts are still the same. With the bevel-up orientation of this Low-Angle plane, it is very simple to adjust the effective cutting angle, by applying a micro bevel. The plane’s iron is bedded at 12-degrees and the iron comes with a 25-degree primary bevel. If you want to handle straight grain, I’ll apply a micro bevel of 5-degrees, bringing the iron to 30-degrees and with the bedding, you have 42-degrees. If I’m working on some curly maple or other figured wood that is more difficult, I may apply a micro bevel of between 15-20 degrees, bringing the overall effective angle to 52-57 degrees. There are also toothing blades available for this plane that can rapidly work the most crazy grain, to get it flat, without tear-out. Follow this by a freshly-sharpened iron, set for a super fine shaving (around a .001″ or a thou), to remove the grooved surface left by the toothing blade. We demonstrated this technique at almost every event, and can end up with a mirror-like surface on the crazy grained boards. There is also a 90-degree iron available, which puts this plane into scraping territory. So, to summarize, I’d get the #62 with an extra iron (standard) on which I’d hone a micro bevel for my higher-angled work, and hone a micro bevel of 5-degrees on the iron that came in the plane. Just swap the irons depending on your work. I’d also get the toothing blade if you are planning to work much of the super-figured woods, as this really does expedite the process. I hope this helps. Feel free to either post another comment on this blog or send me an email directly, if you have any further questions.